May's open garden is the beautiful gardens of Ray and Bonnie Brooks. Ray is our Society's treasurer and also a skilled woodworker and gardener. Set on over an acre of land, the Brooks have a varied collection of plants. Wanting to grow plants that do not necessarily love the Escondido weather, the garden includes a large greenhouse/conservatory with many in-ground plants and a propagation area. Be sure to check out Ray's newest garden, the 'Cycad Terraces' with over thirty in-ground and potted cycads. Take some time to wander or just have a seat and relax beside the waterfall in his 'Secret Garden'. 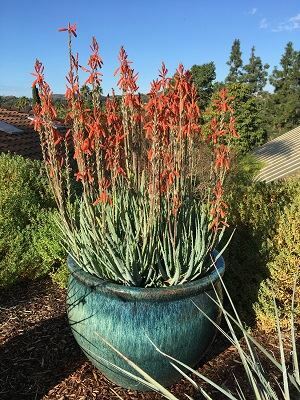 While touring the garden be sure and check out the Cycad collection (over 70 in pots and in the ground), the Secret Garden, the Waterwise front yard, the Rainwater collection (2000 gallons collected) and much more! If parking near the house is full, there may a bit of a walk from your car to the house. Or come later in the day when there are fewer people! Wear a hat and sun protection. Comfortable shoes for walking recommended. Handicapped access to the garden is limited. Please no children under 10 or 12. Too many spiny plants. Water and snacks are provided.